Skaap Wines vineyards are situated in the world renowned wine producing region of Stellenbosch, South Africa. A region that consistently produces some of the finest new-world wines. We're situated in the world renowned wine producing region of Stellenbosch, South Africa. A region that consistently produces some of the finest new-world wines. Our vineyards are located at the end of the Schapenberg (Afrikaans for sheep mountain) Wine Route, at an altitude of 250m. Nestled between the Hottentots-Holland Mountains and False Bay this area is known as the coolest in the Stellenbosch wine growing region. We use as many natural products as possible, to work in harmony with nature. We choose not to irrigate and each vine gets individual attention to ensure perfect balance and the production of small berries with concentrated fruit flavours. 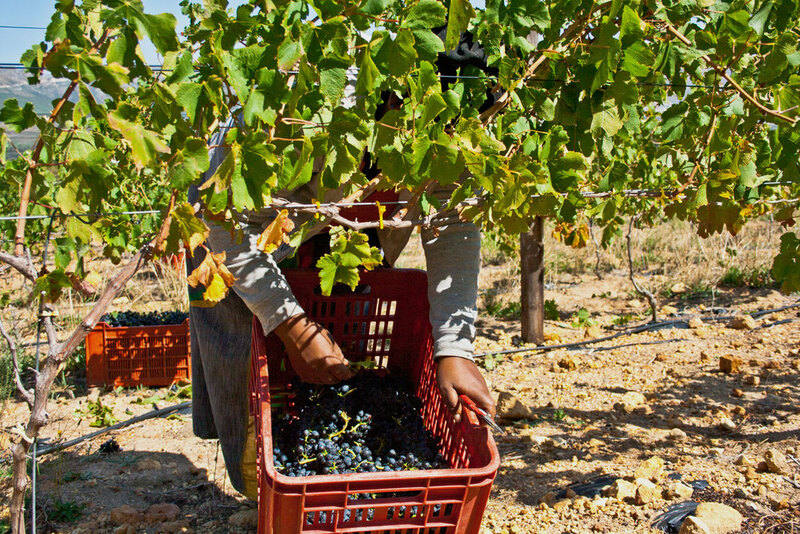 The vines are constantly monitored, with all pruning, spraying and harvesting being done by hand. Although not always the easiest, quickest or cheapest method of farming we're convinced a natural, sustainable approach to vineyard management produces the best wine and is kindest to the environment. We have a no compromise attitude to getting the best possible wine in the bottle. It all begins with the grapes. You can’t make a great wine from poor grapes, which is why we take a long time selecting the best fruit. Once a picking date is agreed with the farm manager, 80% of the wine is already made. We monitor the ripening profile of the grapes and select on taste. We then know exactly which grapes are at their optimum ripeness and can harvest at precisely the right moment. In the cellar, the focus is on allowing the grape to express it’s true character and that of its origin (“terroir”). For us, the role of the winemaker is to let the wine make itself. We only guide the wine in the right direction by selecting the correct yeast for it’s profile, giving more or less skin contact, fermenting at just the right temperature, or even aging it in oak if it will improve the wine. And we keep ourselves up to date on the latest research and cellar technology to see if there’s anyway of improving the wine even further.